Breckenridge Grand Vacations (BGV) recently awarded their 2016 Spring Grants, totaling over $134,800 in cash contributions and in-kind donations. For decades, BGV has been awarding grants to a variety of charitable causes, but this is their first time doing so through their new philanthropic program, BGV Gives. The program is now structured to award grants during two annual cycles, one in the spring and another in the fall, which gives applicants the chance to choose the most appropriate grant cycle. As Breckenridge Grand Vacations prepares to honor their late Owner/Developer, Rob Millisor, with The Inaugural Rob Millisor Heart Health Walk on June 11th, the company continues their philanthropic efforts by increasing access to charitable resources and opportunities provided by the BGV Gives Program. Health and human service related causes received a total of $50,500 in grants, benefiting organizations like The Cycle Effect and Advocates for Victims of Assault. 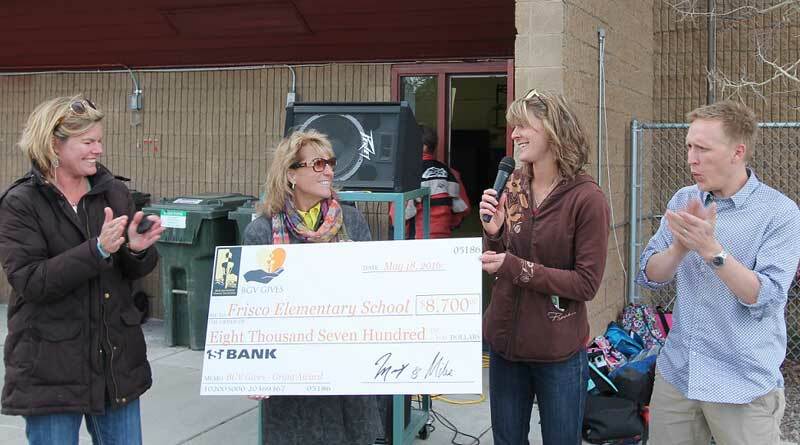 Timberline Learning Center and Frisco Elementary School were among some of the local educational and pre-school recipients, a category that received $29,500. Beneficiaries in the sports, recreation and environment group received a total of $22,300. Other grants of $1,000 or less that didn’t go through the grant process and were reviewed by the BGV Executive Committee amounted to a substantial $8,600 in donations. The grand total through this fund produced $112,400 in cash contributions to the community this spring, but BGV didn’t stop there. On top of that, in-kind donations of lodging and spa certificates valued at over $22,400 have benefited various causes and more than 18 local organizations in the first half of 2016. Additionally, in-kind lodging is being provided for the upcoming Breckenridge Grand Vacations Golf Tournament, taking place in conjunction with The Rob Millisor Heart Health Walk over the weekend of June 11th and 12th. To learn more about the BGV Gives Program and The Rob Millisor Heart Health Walk, please contact the BGV Gives Program Manager, Deb Edwards at (970) 547-8748. Founded in 2016, the BGV Gives program was established to facilitate and further extend Breckenridge Grand Vacations’ philanthropic reach, while inspiring fellow community members to give more, by providing resources and opportunities to help others in need. While BGV’s charitable efforts began many years ago, the October 2015 passing of BGV Owner/Developer, Rob Millisor, inspired the company to elevate their giving to include fundraising. In the wake of Rob’s passing, BGV also implemented a stronger philanthropic infrastructure by branding BGV Gives and hiring the BGV Gives Program Manager, Deb Edwards, who is helping streamline and enhance BGV’s grant program, ensuring that every donated dollar is leveraged to have maximum impact within the local community. BGV is excited and humbled to continue Rob’s legacy of giving, with a primary focus on health, human services and education.